Breaking a six-year streak, Georgia State’s research saw a drop in total award amounts in the 2018 fiscal year due to budget cuts stemming from the Trump administration. Georgia State is among the nation’s leading research universities. The university’s total award amount steadily rose to $66 million in 2012 and to a peak of $147 million in 2017. However, the award amount has since fallen to $122.9 million in 2018. The Georgia State University Research Foundation is the nonprofit corporation that plays the role of securing grants from external sources for supporting the research activities at the university. This cut in federal funding is due to the 2018 U.S. Government Budget as proposed by the Trump administration. This budget includes an 11 percent cut to the National Science Foundation (NSF) which provided 24 percent of all federally funded basic research in American universities in 2017. Additionally, there was a complete removal of funding for the National Endowment for the Arts and the National Endowment for the Humanities. The National Institute of Health (NIH) provided $8.4 billion in grants in 2017 but saw a 22 percent cut for 2018. At Georgia State, in the 2017 fiscal year, the NIH provided $34.3 million in grants. 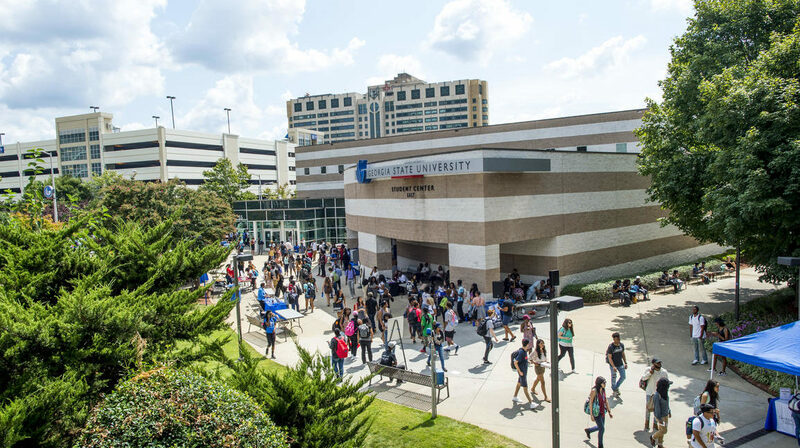 The following year, after budget cuts, it provided only $29.4 million to Georgia State. Weyhenmeyer emphasized the importance of research funding on all levels. “Research funding is tremendously important not only to the university but to the lives of all Americans. That’s because investment in research is investment in the future of our country,” he said. The Georgia State Research Portal provides in-depth data on research project funding awards and grants for each fiscal year. Several Georgia State colleges stood out in total funding amounts, receiving a significant portion of the whole. The colleges, in order of least to most funding, are: the College of Arts and Sciences, the Andrew Young School of Policy Studies, the College of Education and Human Development and the Institute for Biomedical Sciences. Ann-Margaret Esnard is the associate dean for research at the Andrew Young School of Policy Studies (AYSPS), which received $19.6 million in grant funding in 2018. “The decline in federal awards affected our College as well. However, we have a diverse portfolio of sponsor types which is an important aspect of our College,” Esnard said. She noted that a goal would be to continue diversifying their funding portfolio. “The Georgia Health Policy Center (GHPC), based in the AYSPS, led in grant funding,” she said. The GHPC received approximately 52.3 percent of all AYSPS funding, or $11.2 million. One of the larger single donations to the AYSPS was a $1 million grant to the Urban Studies Institute (USI). The grant came from the NSF to lead international research on urban resilience. Moving forward, Esnard has a few goals for 2019. She said, “Another interdisciplinary initiative for FY19 focuses on the new economy.” Esnard elaborated on this initiative. Walt Thompson is a Regents’ Professor and the associate dean for graduate studies and research in the College of Education and Human Development (CEHD). “Our college has received grant funding across a wide range of disciplines, from teacher preparation to human development and service-related fields,” Thompson said. The CEHD received $19 million in 2018. “Assistant Professor Brett Wong received a $1.5 million grant from the NIH to better understand health disparities in the black population in the United States,” he said. The study focuses on blood vessels and sensory nerve functions. “The main goal is to understand what may be predisposing non-Hispanic blacks to higher rates of hypertension and nerve dysfunction if they were to become hypertensive or diabetic,” Wong said in a press release. Another high-dollar grant was given to the coordinator of Georgia State’s Best Practices training for Pre-K teachers. “Sherry Howard also received $1.6 million from the Georgia’s Department of Early Care and Learning to continue offering professional development opportunities for Georgia Pre-K teachers,” Thompson said. Thompson is looking forward to 2019. “Even though we saw a slight decrease between FY17 and FY18, we’ve already received $2.4 million in research funding so far in 2019 and we’re optimistic that we’ll be up to about $20 million by the end of the fiscal year,” he said.